Also try the Translating for Success on page 560 # 1, 3, 4, 6, 7, 10. 1. Most billiard tabls are twice as long as they are wide. What is the perimeter of a billiard table that measures 4.5 feet by 9 feet? 2. A parallelogram has base 2.3 cm and height 3.5 cm. What is the area? 3. A trapezoid has base 25 cm, top 16 cm, and height 35 cm. What is the area? 4. A triangle has base 4 m and height 3.5 m. What is the area? 6. [Section 9.2 # 45] A square with sides 30 cm long has the top quarter removed (like a triangular 'bite' taken out of the top). What is the remaining area? 7. To protect an elm tree in your backyard you need to attach gypsy moth caterpillar tape around the trunk. The tree has a 1.1 foot diameter. What length of tape is needed? 8.The standard backyard trampoline has a diameter of 14 feet. What is its area? 9. The circumference of a quarter is 7.85 cm. What is its area? 10. [Section 9.3 # 17] You want to install a one yard wide sidwalk around a circular swimming pool. The diameter of the pool is 20 yards. What is the area of the donut-shaped sidwalk? 11. [Section 9.3 # 21] A circle of radius 4 yards has its southwest quarter removed. What is the perimeter of that "Pac-Man" shape? 12. [Section 9.3 # 27] An ice cream cone shape is made from a triangle (base and height both 2.8 cm) with a half-circle on top (diameter 2.8 cm). What is the total area? 13. A half-circle window has diameter of 8 feet. What is its perimeter? 14. How many square feet are in 36 square yards? 15. 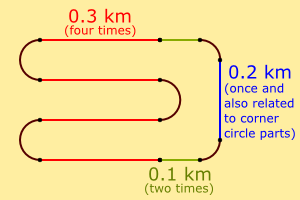 How large a circle (how big an area?) can fit inside a rectangle of base of 12 feet and height of 5 feet? 16. A square is cut in half. The perimeter of the resulting rectangle is 30 feet. What was the area of the original square? 18. What is the square root of 225? 19. What is the square root of 169? 20. What is the square root of 21? 22. Find the length of the race track pictured below. What is its length as a percentage of the famous 2.6 kilometer Curitiba Oval in Brazil?